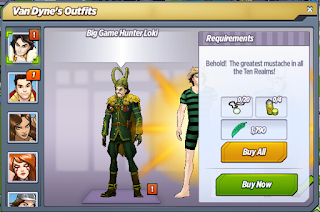 Big Game Hunter Loki is a new character outfit you can create for Loki during the Monsters Unleashed Special Event. It gives him two new actions - Set Your Trap, 2h (Avengers Park) and Be Very, Very Quiet, 2h. It also allows him to train and fight bosses during the event. 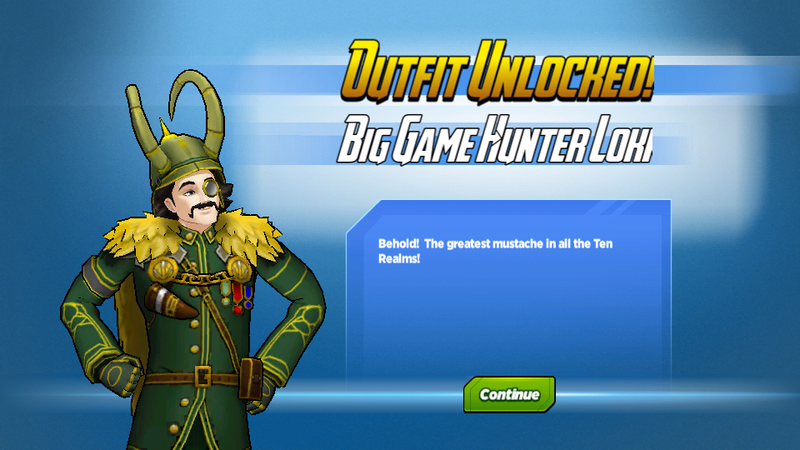 Get Big Game Hunter Loki! Odin: I know that look all too well. Loki: I only want to help battle these fearsome creatures alongside my courageous classmates. Odin: Nothing is ever that simple with you, Loki. Loki: Blood from a prehistoric beast...Fangs from a monster made of shadows...Scales from a creature who feeds on electricity...And paprika. Big Game Hunter Loki: Indeed. I feel especially majestic. Powerful. Noble. Unstoppable. Wasp: I totally didn't think you could grow a mustache! Big Game Hunter Loki: Pssh. Of course I can grow a mustache. I'm a god. Wasp: Why do you smell like glue? Big Game Hunter Loki: I may have snuck into my father's room while he slept, cut of a chunk of his beard, dyed it black, and glued it to my upper lip. Big Game Hunter Loki: Take a primitive Midgardian photograph, it will last longer. Big Game Hunter Loki: Only the greatest, most distinguished hunter of monsters in all the Ten Realms. Black Widow: It would be a lot easier to sneak up on monsters without all of the jewelry and medals. You sound like a mustached silverware drawer. 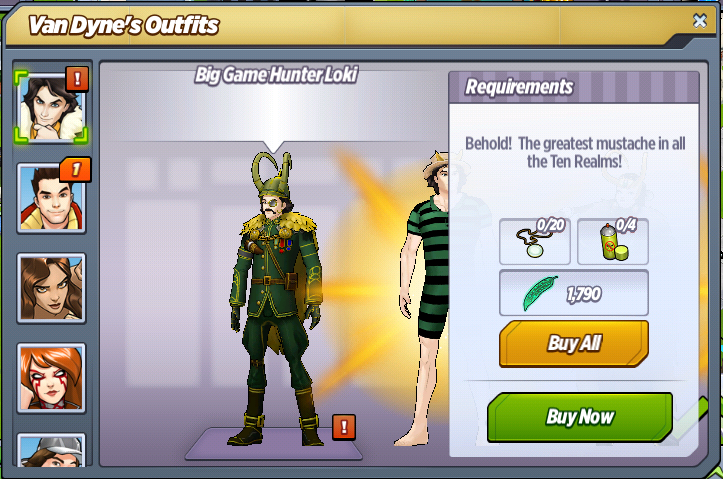 Big Game Hunter Loki: Not everyone wants to dress like a grieving inkblot. If you'll excuse me, I have monsters to hunt. Angela: You frightened my prey. Big Game Hunter Loki: Your prey no longer belongs to you. Every creature walking this world is destined to be an ingredient for my sorcery. Angela: Unlike you, I don't play at being a hunter. And I don't play with anyone who obstructs the hunt. Big Game Hunter Loki: Unlike you, I don't care about anything you say. Sif: It's generally not a good idea to anger Asgard's assassin. Big Game Hunter Loki: I anger my siblings. That's my thing. Sif: Angela and I are monster hunters by trade, Loki. Your absurd persona is doing nothing but hindering our success. Big Game Hunter Loki: I hinder the success of others. That's also my thing. Sif: Why must you always make everything so difficult? Sif: Of course. That's your thing. Blade: Why were you hanging upside down? Big Game Hunter Loki: None of your business. Blade: Dusting suckheads is my business, and business is picking up. Blade: Vampires hang upside down. I put stakes in the hearts of vampires. In summation, if you hang upside down, there is a strong possibility that I will stab you in the chest with a sharp stick. Big Game Hunter Loki: What is wrong with all of you monster hunters? Blade: Nothing that dusting suckheads can't fix. Odin: How goes the hunt, Loki? Big Game Hunter Loki: Dreadful. I've found more monster hunters than actual monsters, and the hunters are far more frightening. Odin: You've forgotten yourself, Loki. A true hunter uses his natural abilities to catch his prey. You don't have to become someone else to capture these creatures, you have to adapt your talents to the hunt. Big Game Hunter Loki: Every once in a long while, you are surprisingly wise. Odin: Did you fashion your mustache from fragments of the Odinbeard? Big Game Hunter Loki: No time for chitchat, father! There are monsters to hunt! Enchantress: Letting others hunt the monsters while you use your sorcery to extract their ingredients from afar. Clever. I'm on the verge of being impressed. Big Game Hunter Loki: There's more than one way to skin a monster. Enchantress: Potions are typically my realm of expertise. What exactly are you planning? Big Game Hunter Loki: My plan remains the same, Enchantress. I plan to sit on the throne of Asgard, and rule the Ten Realms. These ingredients will finally deliver my army. Enchantress: Dark Elves? Frost Giants? Chitauri? 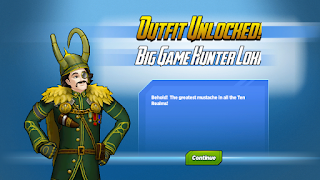 What do you think of Big Game Hunter Loki? Have you got this costume yet?